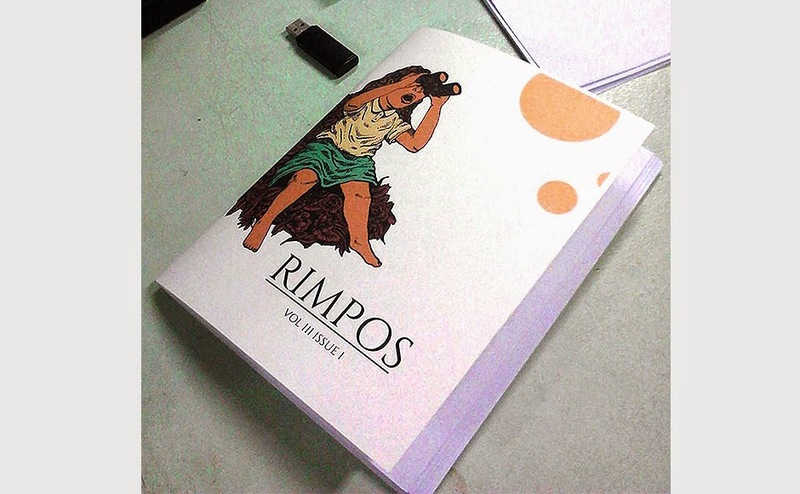 New and young literary voices joined some elder writers during the launch of the literary journal Rimpos at Ateneo de Naga University Instructional Media Center on March 24, 2015. The journal contains poetry, short-fiction and essays by Clinton D. Abilong, Harold V. Alarcon, Elsie Albis, Edna B. Campana, John Leir Castro (Prose and Poetry Editor), Shellah Farina Chan (Poetry Editor), Jose Jason L. Chancoco (Adviser and Consultant), Jan Kevin de Quiroz, Ahj Eufracio, Jasper Ian U. Felezniňo, Dennis B. Gonzaga, Cienna Jaucian, Jerome M. Hipolito, Jusan Villamor Misolas (EIC, Poetry Editor), Val Dominic F. Monit, VDT Nierva, Pen Prestado, Elmer G. Ramos, Jeffrey Regullano, Rea P. Robles, Janessa B. Savilla, Irvin P. Sto. Tomas, Harold V. Alarcon, Milgre S. Asis (Managing Editor), Joy San Jose Agor, Jorge Jonathan Botor, Jr. (Prose Editor), Israfel D. Fagela, Jimmy Seo T. Jose, Mary Martha P. Marcial (Prose Editor), Clark Neola, Ma. Nica I. Ombao, Jay Savosa (Consultant), Irmina Volante-Torres, Eilyn Lamadrid Nidea, Christian Dy and Camille Anne A. Loza. The College of Arts and Sciences Department of Literature and Language Studies Chairperson Dr. Jesus Cyril M. Conde also served as consultant.